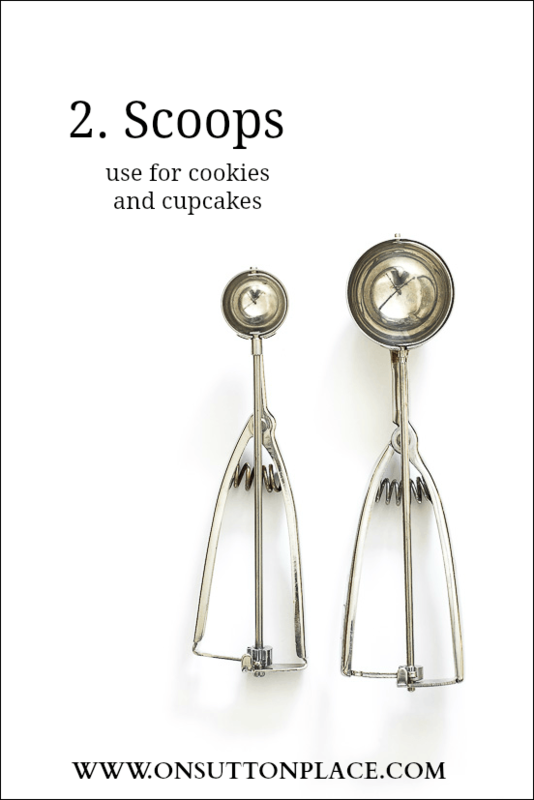 List of handy kitchen tools that will make your time spent baking easier and more fun! 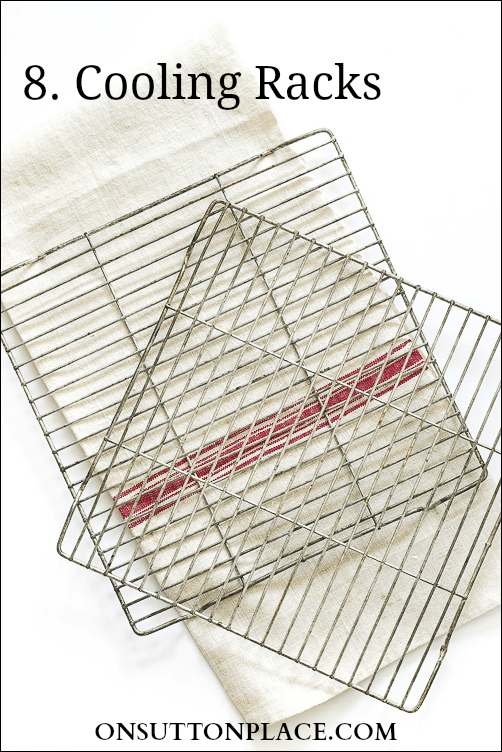 A must-have list of items for a well equipped kitchen. 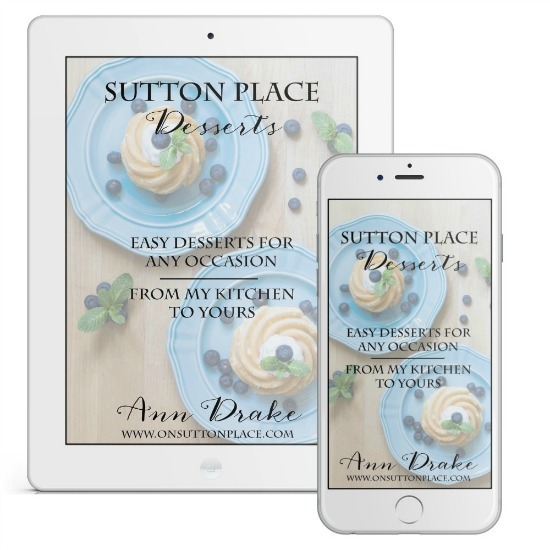 One of the things that I re-discovered when I decided to add recipes to my blog is baking. Or I should say, how much I love to bake. When my kids were home and I was working full time, it was one of the things that went to the end of a very long list. Now, I have plenty of time to spend in the kitchen. I have become re-acquainted with the items in my kitchen drawers. Family heirlooms have been joined by new (and very cool) handy kitchen tools. I’d like to share my favorites…and I want you to know it was very hard to narrow it down to ten! 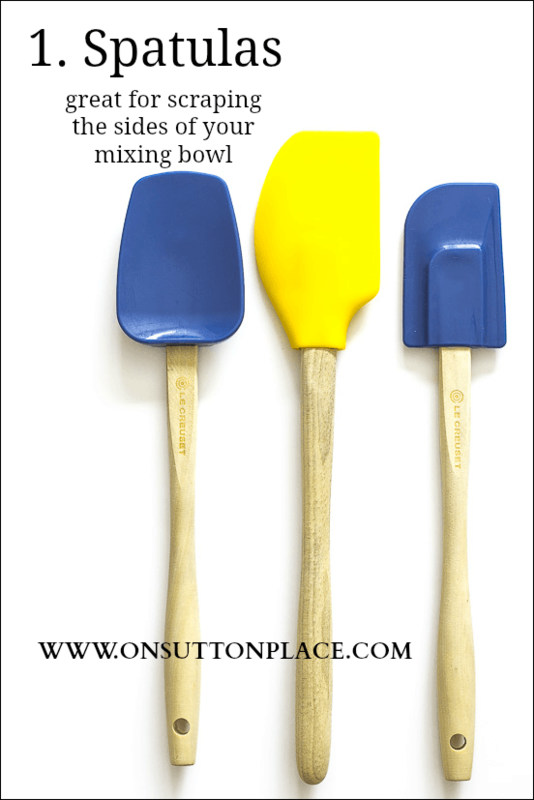 I’ve really never met a spatula I didn’t like, but the colored ones with wood handles are my favorites. They come in different shapes and sizes now. For the past few years, my daughter has been putting new spatulas in my Christmas stocking so my collection is growing. These scoops are amazing. They make the job of dropping cookie dough so easy and the bigger one is the perfect amount of batter for a cupcake. My mom used to drop cookie dough with a teaspoon and her finger. That method still works fine of course, but the scoops are quicker. 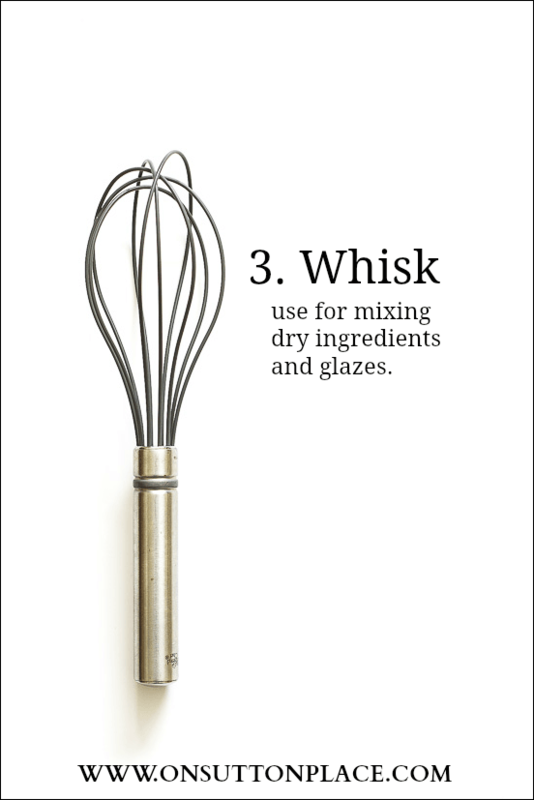 No kitchen tools list would be complete without a whisk. That’s just my opinion but I bet most of you agree. I use my whisk every time I bake to mix my dry ingredients together. I could not live without it. This very rolling pin belonged to my grandmother. I had been married just a few months when she passed away. When we emptied out her house, it made my Dad so happy when I said I would give some of her kitchen tools a new home. 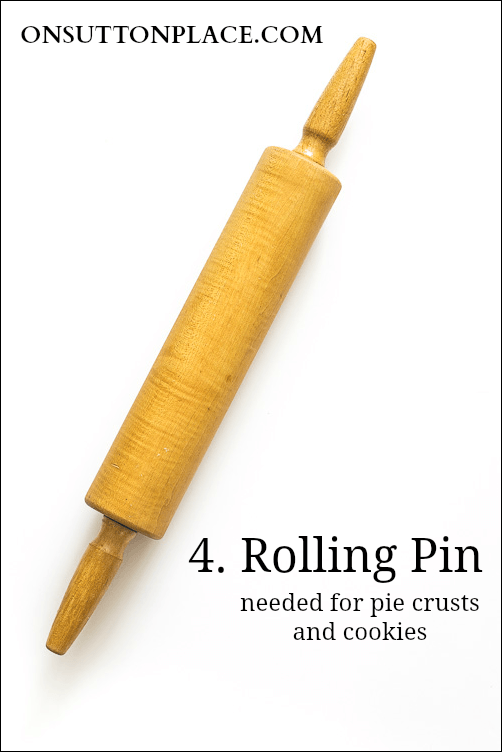 I had never made a pie in my life at that time, but something told me to take this rolling pin. Since then, it’s been used to roll out everything from pie dough to Play-Doh and is truly one of my most treasured possessions. Up until a few years ago, I didn’t have measuring spoons that I really liked. I had a set of plastic ones that were a little flimsy but I used them for years anyway. This All Clad set was a Christmas gift. Just owning them makes me feel a little more legit! The same goes for these measuring cups. They too were a gift and I feel just like Martha Stewart when I use them! I highly recommend a good, solid set of measuring cups. It’s an investment that will last a lifetime. 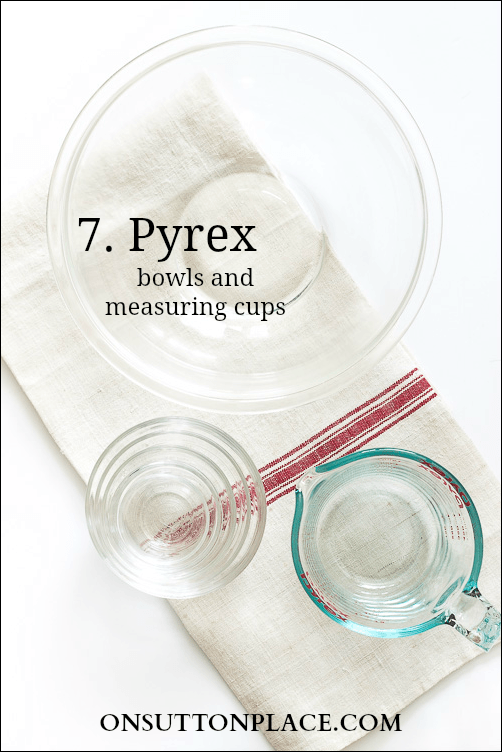 One of my favorite things in the world is Pyrex. Not so much the colored pieces but the clear ones. My dream would be to have a pantry full of well-organized, clear and shiny Pyrex. That’s not going to happen any time soon, so I am content with the pieces I have. I could not live without the big bowl and the nesting bowls. (The nesting bowls aren’t technically Pyrex but they look just like it!) I use them on a daily basis and not just for baking. I have four measuring cups. Two that are 2-cups and two that are 1-cups. The new Pyrex doesn’t have quite the charm that the old stuff has but I still love it all! Cooling racks have come a long way. There are stacking ones and really big ones too. Mine are, once again, from my grandmother’s kitchen. They are a little bent in places but still do the job. Every time I touch them I think of her and that is absolutely the best thing of all. 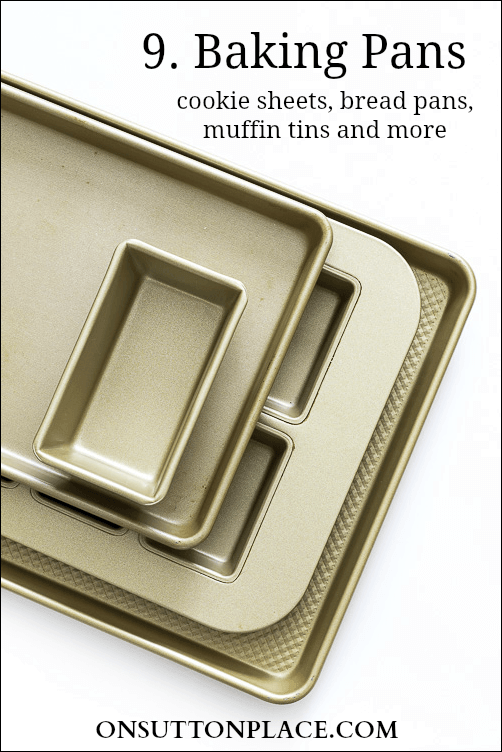 I’ve talked about these baking pans many times on my blog. They are Williams-Sonoma Goldtouch. I discovered them a few years ago and have slowly been adding the ones I want to my pan collection. The very first ones I purchased were the Set of 2 Quarter Sheets. They have little dimples and cookies baked on these pans come out perfect every time. Like the spatulas, I have been asking for these pans for Christmas. I personally have only bought a few…the rest have been gifts. 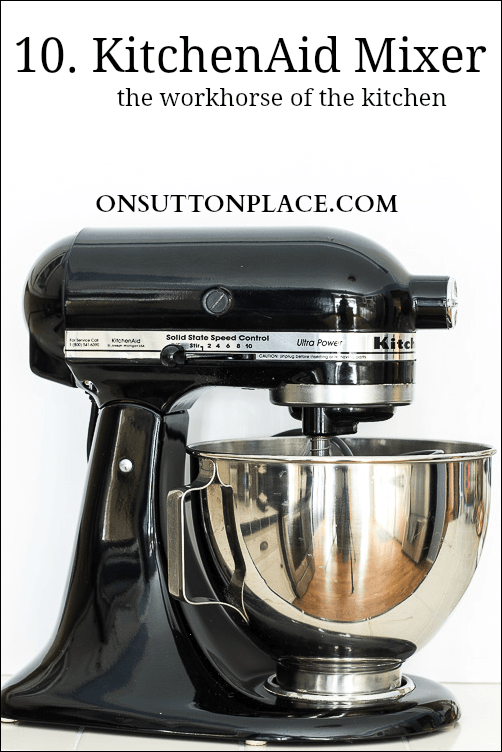 KitchenAid mixers have come a long way in the past few years. Mine is one of the basic models and I got it back in the day when the only color choices were black and white. (Again, a Christmas gift.) Even though this is an investment for sure, I highly recommend owning one if you like to bake. Mine came with three basic attachments but there are lots of new ones that are made specifically for certain jobs. For example, there is a scraper attachment that scrapes the sides of your bowl while you are mixing. Pretty cool. I have thought many times about selling my black one and getting a fun color. Yellow maybe…but in the end I can never do it. We’re sort of a team now. There you have it. I’m not a professional baker…actually I’m not a professional anything. This kitchen tools list is based on my 35 years of experience and what works for me. 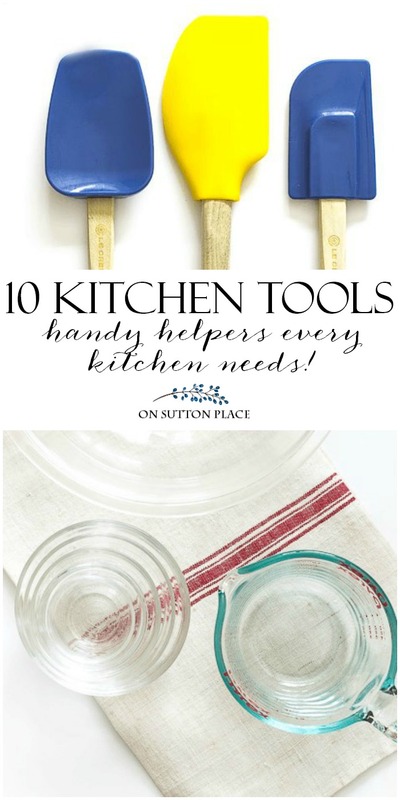 If you have any handy helper kitchen tools to share, please leave me a comment. I love to find new things to add to my Christmas list! All items in this post are linked above and can also be found (except for the Goldtouch) in my Amazon shop. Click HERE. 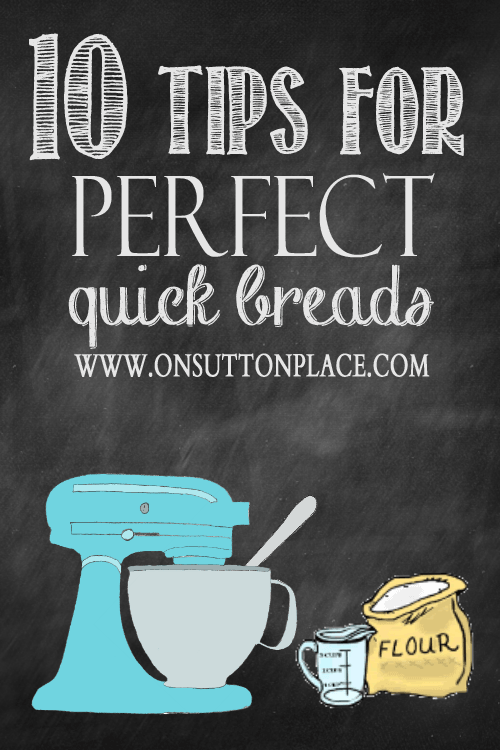 Click the image for my 10 Tips for Perfect Quick Breads! I prefer a spatula that is all one piece. Bacteria can’t get between the head and the handle. I buy an all silicone one from Bed Bath and Beyond. When my daughter was in college she tested my spatulas by scraping some inside wet on a Petri dish! I threw up, then went shopping! Great list! 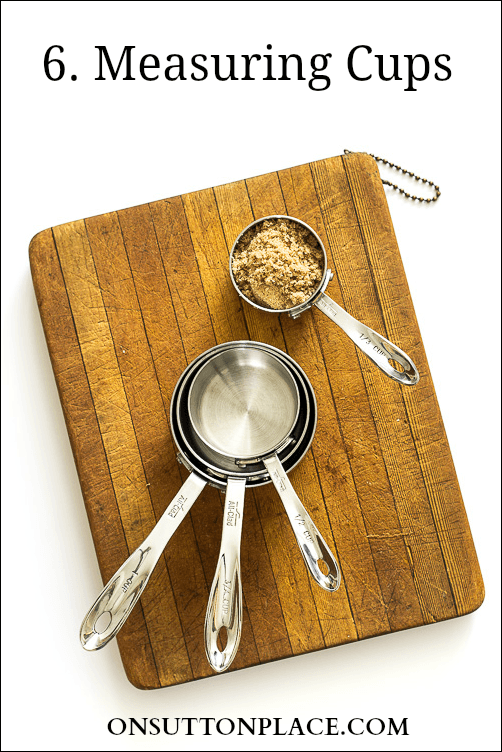 I can add a set of spice measuring spoons that I bought from King Arthur Flour. They’re long and thin, so they fit inside spice jars. My kitchen aid mixer is 20 years old, and my only regret is that I didn’t buy a bigger one. Thank you! My son is currently living in New Hampshire and on our last visit we went to the King Arthur restaurant and shop. I don’t remember seeing the measuring spoons but will look if we ever go again. Happy Spring! 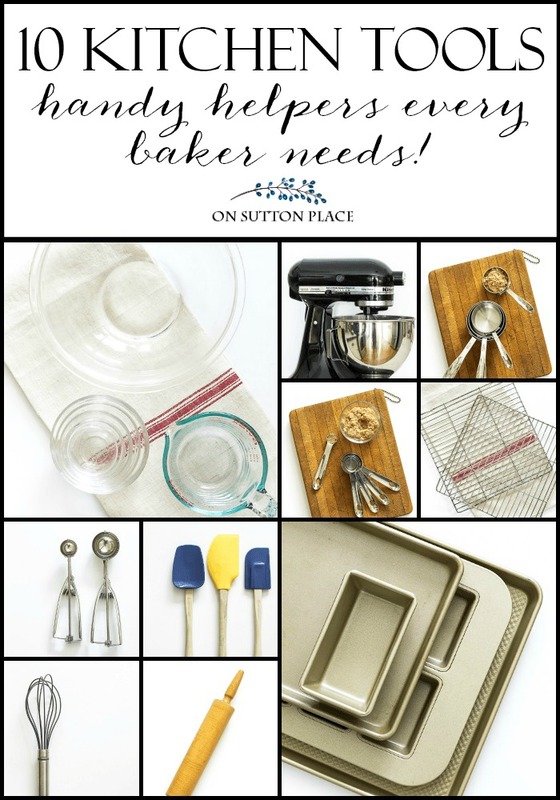 Perfect list for the home baker! I also have my husbands grandmothers rolling pin and use it all the time. Have a wonderful and peaceful Easter. I love that you have your mother and your grandmother’s items. I wish I had some of my mom’s. Another item I can’t be without is a good pastry blender or cutter when making pie dough. Love the all clad too. At 63 I finally got All Clad cookware and wished I’d had them sooner. This baker totally agrees with your list! Your photos are terrific! Your list is awesome, thanks for sharing… I just wanted to tell you your photography skills are phenomenal! I agree with your list! I love to be in my kitchen. But now the kids are gone and my husband and I don’t need the extra treats being around. BUT I do love my spatulas and my mixer. 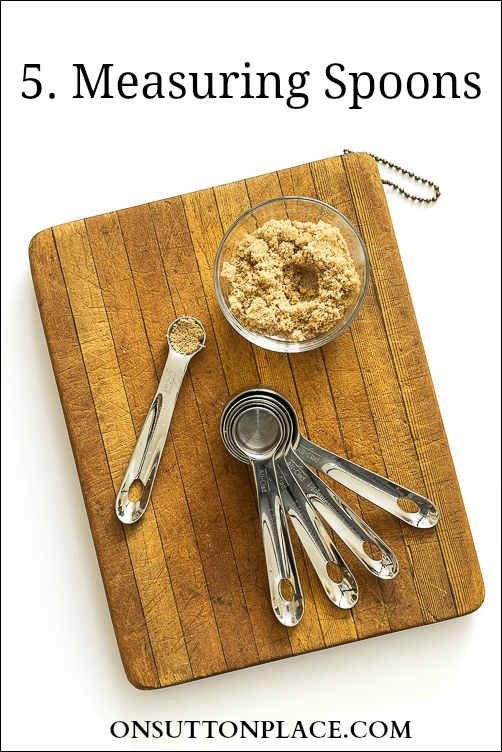 I try to bake bread often and have found these tools cross over to the cooking side …. A must!! I agree with you on this list. They really are essential for the kitchen! I couldn’t live without my kitchen aid mixer. I need some scoops though. I had one years ago and it broke. I’ll have to remember to pick one up next time I’m out shopping. Didn’t think I would have a problem finding a new one, but it took me over a year to find it again. Ann, I love to bake too and I have to say, I’m giggling at your list. It is exactly the list I would have come up with! I love my offset spatulas and my adjustable beaker measuring cup for peanutbutter and molasses. All the other tools on your list are on my list of must haves too. At one point we owned two kitchens in different countries, so now I have 2-3-4 of many things. My granddaughters each have a box with my extras just waiting for them when they have kitchens of their own. Ann, how wonderful that you have your grandmother’s rolling pin and cooling racks! I have my grandmother’s butter mold and churn. As a little girl, I remember watching her make butter and putting it in the mold. Now I’ve heard that you can make butter using a Kitchen Aid mixer! I have a black one, too, and I could not live without it. I’d have to add my Cuisinart food processor to the list as an indispensable tool. along with my microplane zester and a nifty juicer that I have. I will have to check out that bakeware from WS that you recommended. Ann, I bought the most awesome thing online a couple of weeks ago: a set of measuring spoons that are lone and skinny…they fit inside spice jars. Brilliant, I tell ya! Oooh pretty kitchen tools! I love baking too. And I love the LOOK of clear glass pyrex but I have to admit that my beautiful set of bowls – mine are these: (http://www.ebay.com/itm/Homestead-Nesting-Mixing-Bowl-Pyrex-441-/201037801441?pt=LH_DefaultDomain_0&hash=item2ecec967e1) make me smile because the style is exactly what my mother used when I was growing up. Since she taught me to bake it seems fitting. I didn’t know about the WS Goldtouch baking pans though. Good thing Mother’s Day isn’t that far off ;) I love the idea of kitchen tools in your stocking – that’s so sweet! Ann, we could trade places and work in each other’s kitchens! My MIL gave us money for a wedding gift and she went with me to help me select kitchen tools, ironing board, etc. I am still using most of those items 52 years later, but I have added many of the items you mention. (I have Williams-Sonoma on speed dial.) I remember years ago watching the Julia Child’s cooking show where she picked up a 2nd spatula and said (in her wonderful voice), “You know, it’s ok to have more than 1 spatula.” What a concept! Happy baking and thanks for the wonderful suggestions. Great list! I love your rolling pin, too! I bought a Martha Stewart one, but my favorite is the one I inherited from my MIL when she passed away. The only thing is, I’ve used it for cookies, but I can’t make pie crust. Maybe you can share your recipe sometime. Thanks! Those are my faves also. Also love rasp style zesters for shaving chocolate, lemon peel, etc. I saw a great post recently in the blogosphere about someone who resprayed their stand mixer a different colour. If I can find where I saw it I’ll let you know. What a great list, Ann! The rolling pin is my very favorite. If it could only talk! What history! Thank for the tip about the Wm-Sonoma baking pans. I’ll have to try them! I also can[t live without parchment paper! KitchenAid mixers have been my BIG purchases over the years for my daughter-in-law and two nieces’ shower gifts. I have the cream colored one trying to pawn its way to my no baking daughter’s kitchen. I would love the colbalt. Asking for WS Goldtouch baking pans for birthday in April. I love the baking pans and will check them out next time I’m at WS. I have a white kitchenaid mixer and love it but the aqua blue one keeps calling my name. Can’t believe I ever made cookies without a trigger scoop. Wonderful tool in a variety of sizes. Best place to find them is the local restaurant supply store. I would personally add offset spatulas to this list as well. I couldn’t bake without my kitchen aid mixer or my pampered chef scoops. They are a must.